I'd rather have a Seiko Turtle. Is this another one with a pregnant case and a nickel size dial? They seem to have found a working formula - these LEs have been selling out pretty quickly. The Sub 1200T - limited to 1200 pieces (in each color, I believe) - has still not sold out and it's been around for years. Re: Doxa 300 "Silver Lung"
To me they nailed the vintage look with the modern wearability and reliability wither the 300. I have a pro and a rambler. The aqualung pro was another winner imo but now they are moving farther away in the historical accuracy I was a fan of. That to me just comes off as trying to print money. Maybe they will come back to focus with the shark hunter that you can bet on is coming in 6-12 mo. Or they may have “ jumped the shark”... fortunately I like my subs and plan to keep them so if they continue to miss the mark I am good. It always cracks me up when I see people trying to sell a used 1200, and in the description boast about how it's a LE. True, but I'd argue that in a lot of ways, the bog standard 1200T is the best watch modern Doxa has ever made. The 750T’s were an excellent case size. What makes you say that? Just curious, I've never had a Doxa. Perfect size for most wrists, with a great bezel:dial ratio (essentially the dimensions of the vintage 300T), and perhaps the cheapest Doxas out there. I agree. The 1200 is where it’s at. Though the 1000 is pretty similar. I don't disagree with you. Especially with the prices you can pick up a 1200 used...I think I paid $1000 for the last one I had? That's a hell of a watch for a thousand bucks. All of this recent DOXA talk has me thinking about picking up another. I just wish their QC was a bit better. The pic below is from a current ad on TRF for a 1000T TUSA. Is it really that hard to paint a hand properly? Unfortunately this isn't the first pic I've seen of a DOXA with a poorly painted hand. Pretty common issue on their watches unfortunately. Then they will argue with you that you dropped it or something like that to cause the issue. Kind of like my buddies GMT that was a misprint on the dial. They said he dropped so it caused the issue. They are like Kobold in the LE respect. They will offer more of that model to chase more cash. No such thing as an LE. The Tusa is a 10 year old watch now. No doubt there was a few issues like this, but I haven't heard this complaint for a few years. 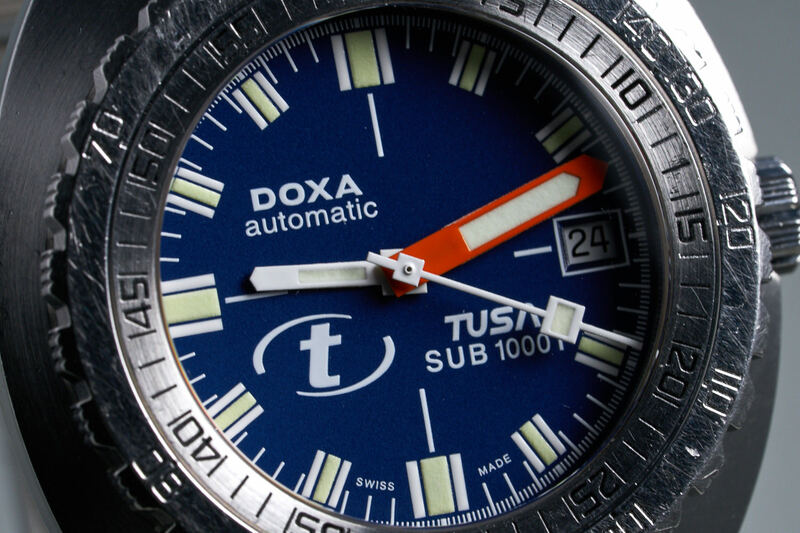 It's possible that DOXA QC is much better now than it used to be, but this TUSA was the first watch I bothered to look at when searching Watchrecon for used DOXAs and the thoughts of past issues came flooding back. Pass. I’ll wait for the BiPax 300 case in Pro and Searambler. I read rumor somewhere to be released probably in 2019.
well you won't read complaints on wus anymore. they still delete them.